This is an update to one of my first blog posts. I think this idea is much better and takes up less room. 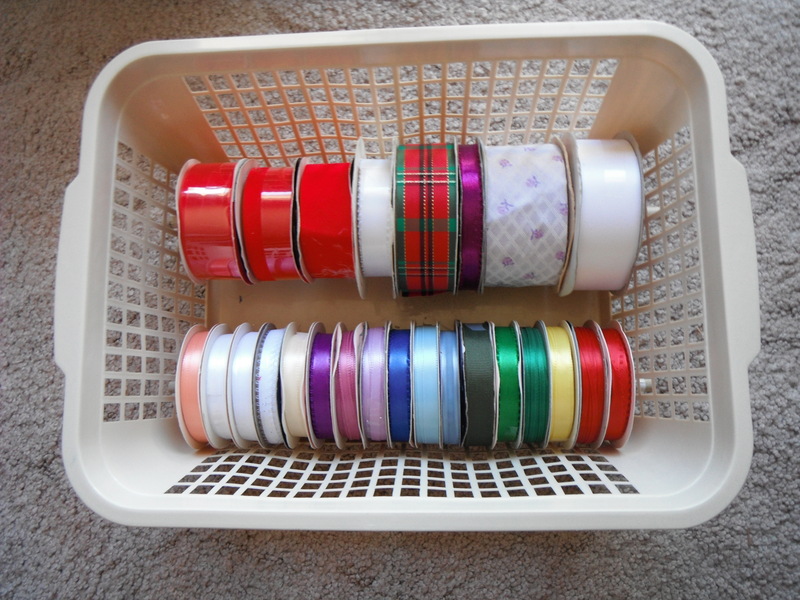 So, when I was first organizing ribbon I used a plastic basket, dowels and some twist ties. This basket was still in my cupboard until January of this year. January is when I started to seriously reorganize the sewing/craft, etc room (that will take multiple posts to show so that will be done some other time). Anyways, I saw on Pinterest (or somewhere) about the idea of hanging ribbons on a mutiple pant hanger (or at least that is what I call it) and I had one sitting in my closet. This allows me to use the space in the cupboard for stackable items (labeled boxes, etc) and I can hang the ribbon holder on the door handle when I am working on a project. When it is not being used it could hang in a closet. You may see another update in the future if I figure a good way to hang extra ribbon below the lower bar (which doesn’t open). Have you ever picked up a jewelry (or for something else small) organizer at a thrift store since it was a great deal and you knew you would find a good use for it someday? Well, I have in the past and I finally determined a great use for one of them. This works perfectly for me since I had bought the Gutermann 26 spool thread (from JoAnn Fabrics on sale) so I had one or two spools of a bunch of different colors. 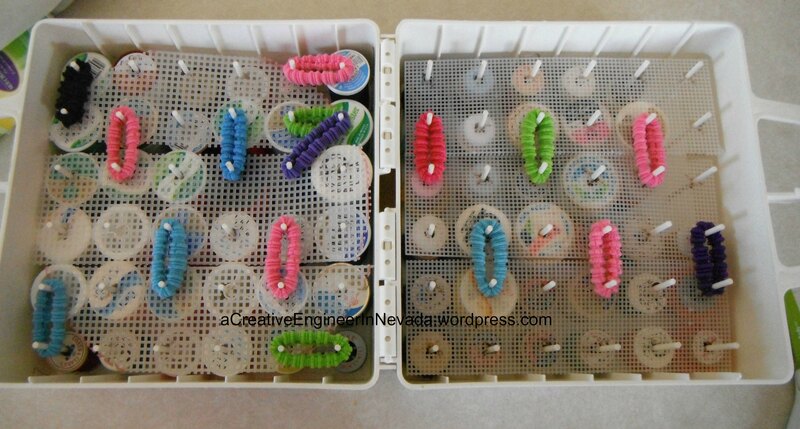 When I am sewing I can take it out and hang it on the cupboard door handle and see the options that I have. If you saw a previous post ‘Specials Words of 2015’ then you know that one of them is Simplify. Here is the second project that I did that has simplified an area of my life (which in this case is the corner cabinet in the laundry room). 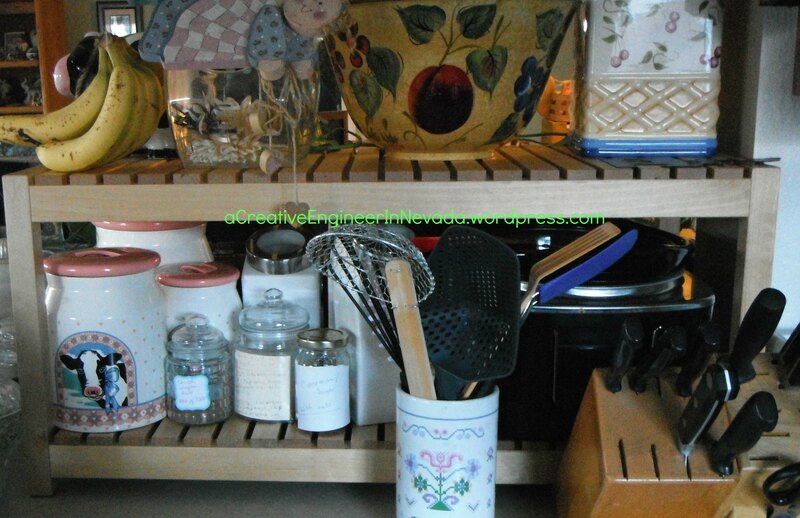 We use the corner cabinet as an extra pantry area, but it was difficult to keep track of what was stored in there. For years (and I do mean YEARS) I had a piece of paper taped to the inside of the cabinet with a semi-running list of what was inside. I knew there had to be a better way. Last fall, I found a roll of cork sheeting (on Clearance after school started) and cut a piece to fit the inside of the door. One problem was it didn’t like to lay flat and the second one was I realized I couldn’t nail it to the door, but tape and glue would not make it stay. 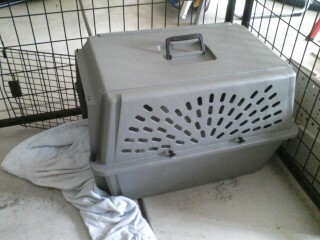 So, that came down and I still needed a solution. I realized the A4 size should fit (or would be easy to cut down) and I liked the idea of liquid chalk (I hate using regular chalk, especially in dry Nevada). Once they arrived it took me about 5 minutes to have three of the Blackboard Stickers installed. It was tricky to get the Liquid Chalk Marker Pen to work at first, but then it went on neatly and dried pretty quickly. So, I will be taking everything out of the cupboard and writing it down on the sheets when they go back in. Hopefully then we will be able to keep track of everything. How do you keep track of your pantry inventory? Here is the first project that I did that has simplified an area of my life (which in this case is in our hall closet). Inside our hall closet we had two baskets (on the shelf above my head) which contain the winter gloves, winter scarves, winter hats, gloves, rain poncho, baseball caps, etc. Also, the flashlight is kept on that shelf or the one above, which I can’t reach (have I stated that Handy Husband is taller than me and can reach a lot farther up than me?). This last summer I added one Command hook to the inside of the hall closet for our summer hats since they would get buried in the baskets (along with the gloves, etc). The other day I bought an over the door multiple shoe organizer, but didn’t want it to be ‘over the door’. I also bought a package of Command hooks. After I hung the multiple shoe organizer up I loaded it with the light items that we would use the most (including the small flashlight). It is now so easy to grab a pair of winter gloves when I am pulling my coat out of the closet. Where do you keep your winter gloves, etc? I have decided this year I can’t go to a thrift store unless I have dropped off at least one bag as a donation that month (hopefully that way more unneeded items leave the house than needed items coming in). a new ‘hot pink’ purse organizer for $2.00 (which was greatly needed since my current purse is black inside and I was constantly losing my keys inside my purse!). 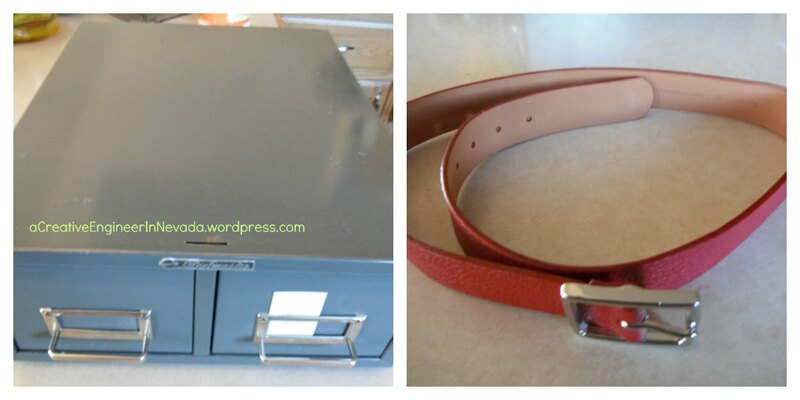 IKEA hacking – have you heard about this? Until I started going on Pinterest I hadn’t really heard of IKEA (furniture) hacking, but now I know there are at least two websites that are totally about hacking IKEA furniture. This last weekend we left the high desert of Nevada for Sacramento, CA. It was nice to get away for the weekend. We went to the Sacramento Zoo and then went to the IKEA store in West Sacramento. We walked around all of the showrooms and now that I have seen how people have modified IKEA furniture I looked at everything in a different light. One thing we have been looking for is a ‘structure’ to put on our kitchen counter so we could store the crockpot and some of the flour containers, etc in a way that we could gain some counter space. So, what projects have you been working on? 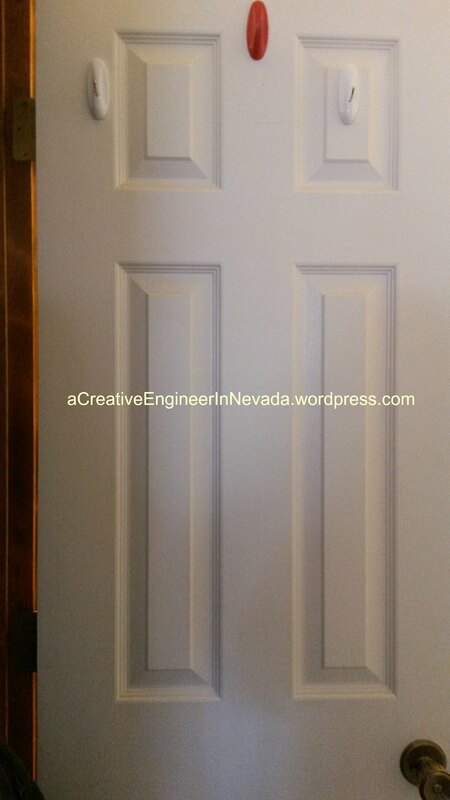 I added an email address on the ‘About’ page acreativeengineerinnv@gmail.com so send me a message! Can you believe it is already mid-February? I can’t. Our weather has even warmed up at least for the next few days. I have a pile (10+) of draft posts, but I can’t believe I haven’t got them and the photos together so I could post them. Getting these posts done is one of my projects for this month. 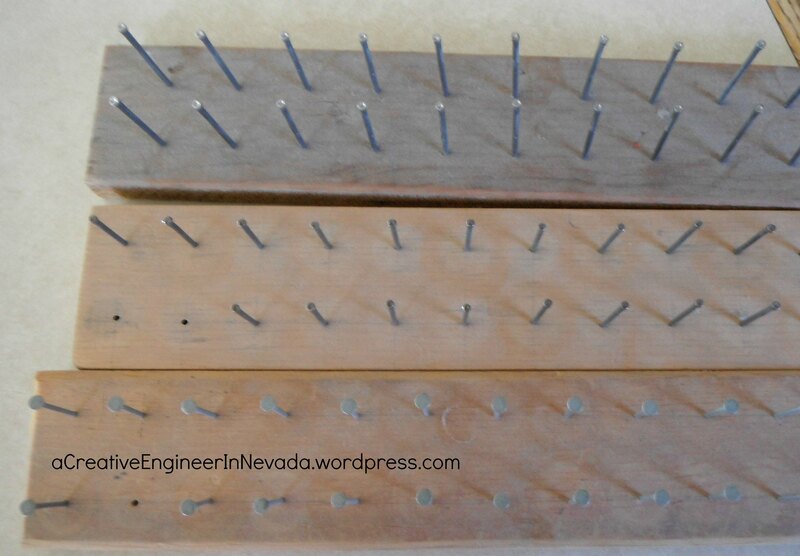 Yup – nails on boards which didn’t keep the thread protected from the dust, etc. So, to fix the problem I used a piece of plastic canvas I had sitting around and some small ponytail holders I had and made removable covers that stay in place when the unit is closed. My fix is so much better than the way it arrived. Hope you all have some fun with friends and family today. So, I collected the recipes I could think of and started adding the titles (with cookbook name and page, etc) to the colored card stock. I was surprised to see we had about 40 main dishes. Next, I cut the main dishes into strips and put them into the (mostly matching) colored envelopes I got from the Dollar Store. The bargain I got from Michael’s was a Metal board with a giant ‘E’ on it for 50 cents (90% off). I was not sure what I would do with the ‘E’, but I could see it would easily peel off and the board was decoratively painted. The metal organizer holds the colored envelopes with the unused dishes (with the meat type written on the envelope), a colored envelope that contains the used main dishes (I am writing the Month/week number of the back as we use a main dish) and a colored envelope that contains blank strips so I can add dishes as we think of them. 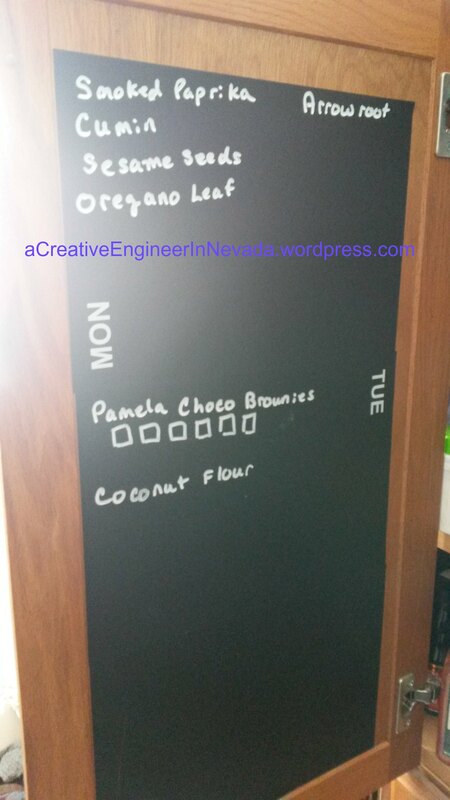 The magnetic Days of the Week and the main dish strips are hung on the metal board. If something comes up then I change out/remove that day’s main dish. So, that is our Menu Planning setup. It has helped us eat different meals and so far we have not repeated many meals. If you make something similar I would love to hear about/see it. Do you ever have ‘well laid’ plans and they all go out the window? Well, the last couple of weeks I have been in ‘catch up mode’ and I can’t believe it is already the second week of October. So, I figured I would start by showing some of the bargains I found at the local Thrift Stores/church Rummage Sales recently. 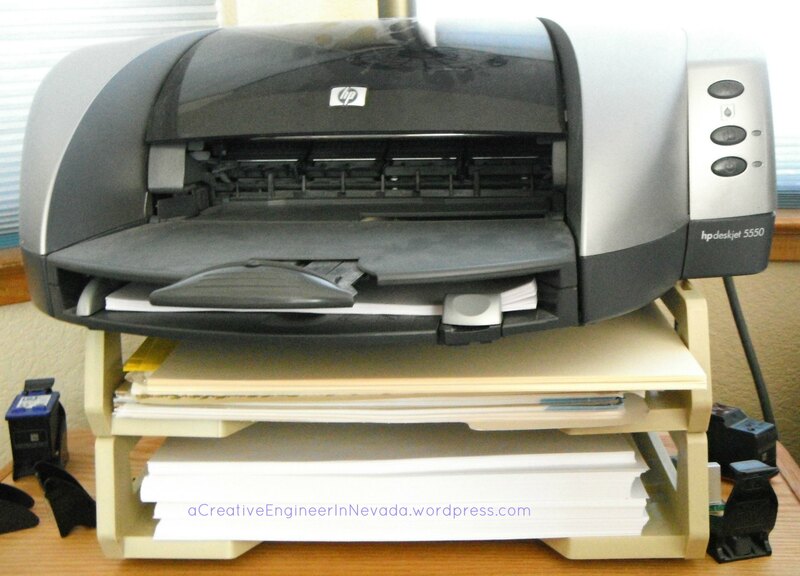 c) Printer stand: I found two interlocked paper files for $2 that I am using as a stand to store the paper for the printer. One section has the plain regular paper and the other section has some of the special paper (colored, cardstock, photo, etc). I was concerned about the printer weight on the stand, but it has been holding up for about a month so far. d) Note paper: As a present to my mom I usually get small packages of colored computer paper from the Dollar Store and print a header on it so she can write letters. At the thrift store I found a large box (about 200 sheets) of white note paper for $2 so I printed the header on half of it and gave her the box of paper. She really liked it (sorry – no photos). I hope this motivated you to go looking at items in Thrift Stores in a new light (before I never would have picked up a bright pink metal hanger). Do you ever say ‘Well, Duh’? I have been trying to organize our ‘office area’ (part of the great room) without spending a lot of money. I saw a post on Pinterest the other night that said they used horizontal paper organizers for organizing their first aid supplies. 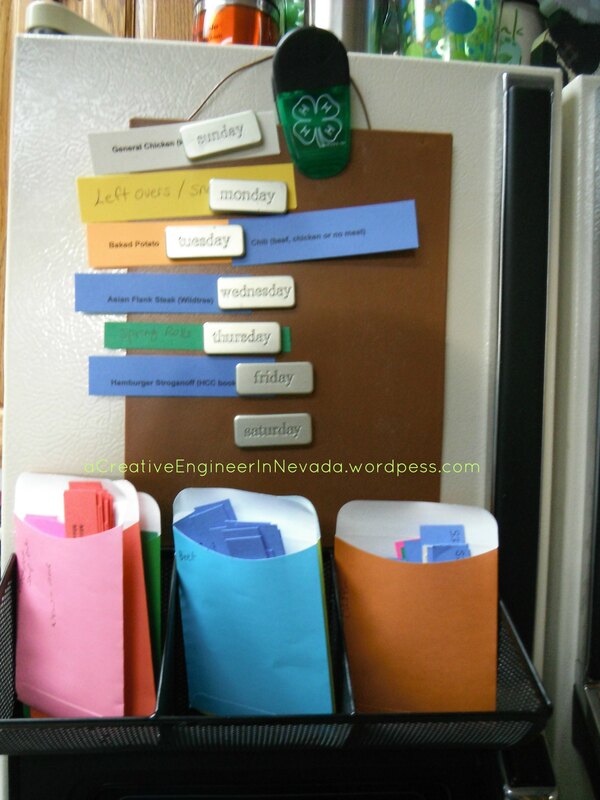 Well, I went to bed that night and realized that I saw paper organizers at the local thrift store AND they would work to organize the paper for the printer (put them below the printer) – well, duh. So, I picked up three (two are made to stack together) for $3.00, cleaned them up and put the double stack below the printer. It now has a stack of plain white paper and another stack of special paper – card stock, bright colored, etc. Now the family members won’t have a problem finding paper when the printer runs out. I will work on another section tomorrow.